On the second May Day since the fall of Mubarak hundreds of activists from the independent unions and the Left took to the streets in Cairo and other cities across Egypt. Local demonstrations took place in Alexandria, Al-Mansoura, Zagazig, Suez among other cities. Workers took part in the revolution of 25 January and sealed the fate of the president with more than 489 workers’ protests during the month of February alone. 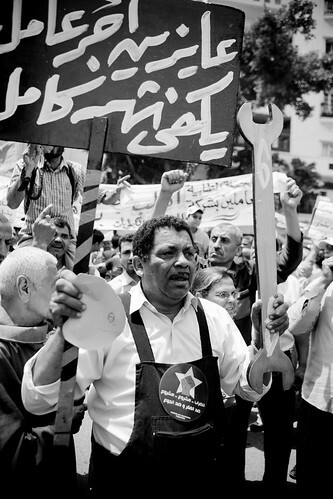 Workers went out into the streets across Egypt for the sake of bread, freedom, human dignity and social justice. A year after the revolution nothing has changed for workers, except that their situation has got worse and they are denounced for their ‘selfish sectional demands’. The working class has sacrificed its martyrs, including Mariam Abd-al-Ghaffar Huwas, one of the Mansura-Espana company strikers. Workers have been dragged through the military courts and leading activists have been sacked from their jobs. Instead of recovering our lost rights, we’ve seen new attacks: Law 34 of 2011 criminalised strikes and sit-ins, and the law on trade union freedoms remains frozen in the Military Council and the refrigerator of parliament. The laws on the minimum and maximum wages have been bypassed, and the government has found a way to evade the court decisions returning privatised companies to the state. Adoption of the minimum and maximum wages in order to ensure a decent life for a workers and their families, and the setting of a maximum wage 15 times the minimum (1500 pounds) which should increase annually according to experience and the rate of inflation. Increase pensions to at least 80% of wages, with annual increases linked to price rises. The enactment of the law on trade union freedoms and support for the independent trade unions. An end to all forms of harassment and repression against the independent trade unions. Participation of workers and their unions in the development of the new Constitution in order to preserve their economic and social rights as articles in the Constitution. Reform the unjust Labour Law No. 12 of 2003 so that it is in the interests of workers. Re-activate the role of the Supreme Council for wages and prices. Abolition of the Social Insurance Law No. 135 of 2010, and the development of the Social Insurance Act No. 79 of 1975 and Law No. 112 of 1980 to provide social insurance to workers in the informal sector. Return of the LE465 billion social insurance funds that were seized. Extension of health insurance to include all Egyptians. The integration of all health services within a public health system funded from general taxes and contributions, with the development and delivery of health services free of charge and through non-profit bodies. Fulfilment by the state of its obligation to create new jobs and the payment of unemployment benefit to those who cannot find productive work. Permanent contracts for temporary workers and the legalisation of their status in order to preserve their rights. Reinstatement of workers who were dismissed and payment of all their arrears. Amendment of the income tax law and increase the exemption for family burdens to 18 thousand pounds per annum, increase the top rate of income tax to 45% and the abolition of stamp tax on the wages and salaries. The return of all the public companies which were subject to a legal ruling overturning their privatisation. The injection of new investment into public companies and public bodies in order to develop and revive them. Restart work at idle factories under workers’ participation in their operation and management, and rejectino of the law which serves the interests of businessmen, manipulators of the economy and workers’ rights. Purge the ministries, government institutions and companies of corrupt leaders and the remnants of the old regime. Protect the dignity of Egyptians abroad and their rights as workers and provide social insurance appropriate to them. Let us unite all our efforts to achieve workers’ demands. Let the month of May 2012 be the month of workers’ rights to decent wages and independent trade unions. We will gather in all the governorates of Egypt to determine how to work together throughout the month of May, the month of workers’ rights. We will not be intimidated by the laws of tyranny. We are united in order to recover our rights and the rights of our children. May 1, 2012 in EFITU, Egypt, Union news.